When the Aspirin had established as an exceedingly successful top DLG over the years, before the German Open Kaltenkirchen 2007 the question came up for us how to developed an even better DLG, to gain a small advantage again. A lot of brainstorming was necessary for that. In several competition seasons we had analyzed strengths and weaknesses of the Aspirin concept. Furthermore the aerodynamic analysis and design tools were improved and aerodynamic understanding was sharpened in smaller wind tunnel tests. 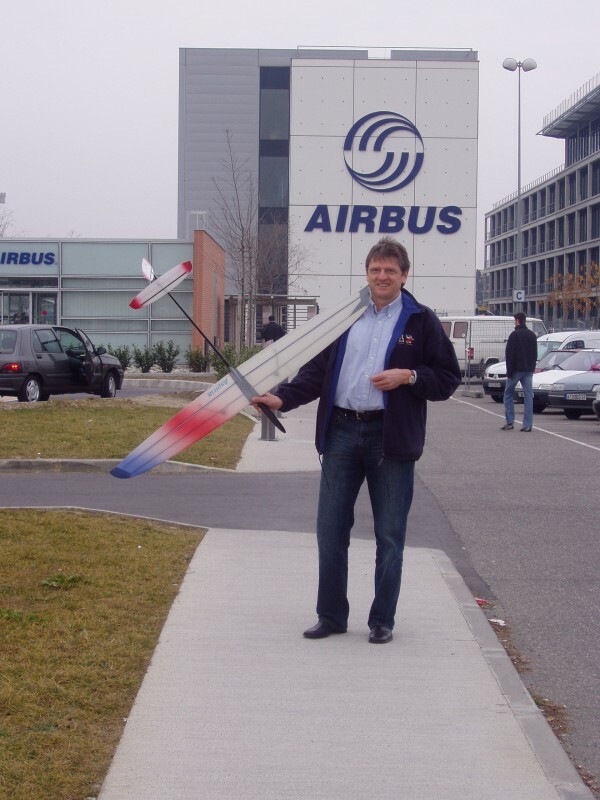 Main goal was again superior flight performance, like for all planes from our workshop. However not only pure performance is important, but also super harmonic flight characteristics to be able to use it under competition stress. Last but not least robustness and functionality play a decisive role, which is especially important in competition. As trying to use diverse concepts for different weather conditions easily leads to loosing the focus, an allround glider without any weakness should be developed. The new plane therefore should be improved in all points over the Aspirin, except inverted flight. It was acceptable to make it slightly more demanding to fly, as the Aspirin’s gentleness sometimes was even a bit too much of a good thing. 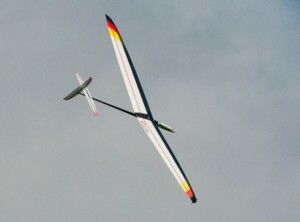 As already the first use in Kaltenkirchen showed, that the aspired goals were completely reached. Already the Aspirin was notorious for its good launch heights, but with the SALpeter these could be increased again. And this at reduced sink rate and better glide ratio. 3 min in dead air are achieved reproducably by good throwers. 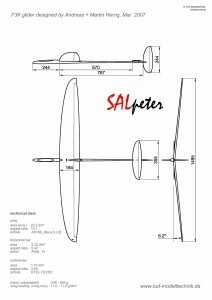 Our known distinctive love of perfection shows up at the SALpeter in aerodynamically, mechanically and optically sophisticated detail solutions. Again we could set trends and create an aircraft of lasting value. A question that also had occupied us a long time was naming. 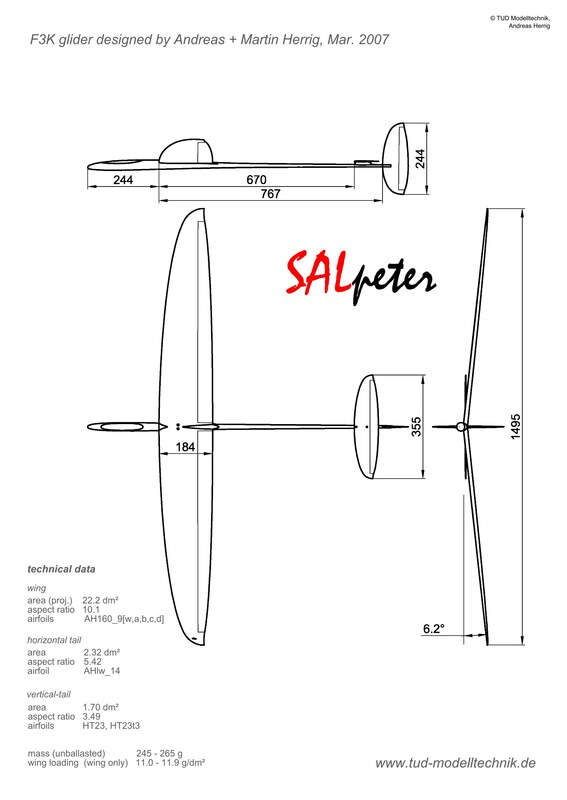 Finally we decided for SALpeter, following the proposal of one active from Dresden, as it could be foreseen indeed, that the plane would work devilishly good and have an explosive effect on the SAL scene in combination with the right pilots.